In a small space at the biennial exhibition Prospect.3 in New Orleans, seven aquariums in artist Glenn Kaino’s installation Tank give off a mechanical hum, generating a white noise that creates an oddly comforting background to their ethereal, fluorescent glows. Each contains thriving coral colonies, bursting with reds and blues. The undersea-biome aesthetic of the installation is striking in itself, but what makes it especially interesting is that the bedrock in which the coral is rooted is not actually rock at all. 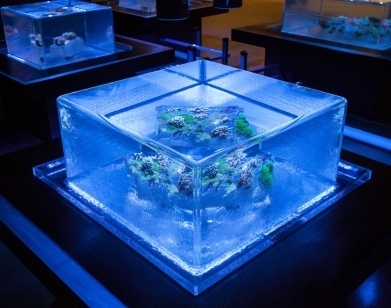 Rather, the reefs are flourishing on chunks of discarded military tanks, or more accurately, clear resin facsimiles cast by Kaino–which makes a surprisingly nourishing environment. Ten years ago, Kaino learned about how the military observed reef beds growing on weapons dumped in ocean areas where reefs had previously been wiped out. He was attracted to “a poetic contradiction that the smallest organisms of the world were reclaiming the instruments of displacement of some of the ostensibly largest [humans], but also that these instruments of war were becoming a biologically positive thing, helping rebuild these reefs.” Two years back, he resolved to recreate the ecosystem for an artwork, which came to fruition as Tank, a commissioned piece for P.3 that is on view through January 25, 2015. While viewers of Tank mull that one over, Kaino is recovering from a busy few months. His three month long solo-show “Leviathan” at Chicago’s Kavi Gupta Gallery ends in December, and Bridge, a suspended footbridge sculpture in Washington D.C. opened last month. Earlier major works have included large-scale pieces that often hinge on a single fundamental element, such as fire in this year’s interactive performance piece The Burning Boards, and sand in 2004’s Sandcastle, which was part of the Whitney Biennial. GLENN KAINO’S TANK IS ON VIEW AT PROSPECT.3 IN NEW ORLEANS NOW THROUGH JANUARY 25, 2015.